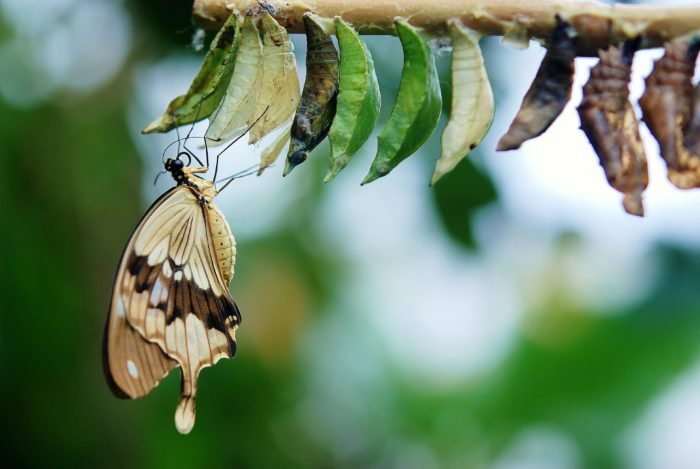 My son was watching a video recently of a butterfly emerging from a chrysalis and it reminded me of a story I often talk about with clients. A boy found a chrysalis of a butterfly. He sat and watched the butterfly for several hours as it struggled to force its body through the little hole at the end. Eventually, the butterfly stopped making progress. It appeared as if it had gotten as far as it could and it could go no farther. The boy decided to help the butterfly, so he took a pair of scissors and snipped off the remaining bit of the chrysalis. The butterfly then emerged easily, but it had a swollen body and small, shrivelled wings. The boy continued to watch the butterfly because he expected that, at any moment, the wings would enlarge and expand to be able to support the body, which would contract in time. Neither happened! In fact, the butterfly spent the rest of its life crawling around with a swollen body and shrivelled wings. It never was able to fly. What the boy in his kindness and haste did not understand was that the restricting chrysalis and the struggle required for the butterfly to get through the tiny opening were nature’s way of forcing fluid from the body of the butterfly into its wings so that it would be ready for flight once it achieved its freedom. we cannot force ourselves to grow or change faster than nature will allow. As a parent I often need to remember these two things, especially when I see my children struggling. One of my goals as a parent is to make myself redundant – for my children to grow into independent, functional adults who can survive in the world without me. But in order for that to happen I need to allow them to: do things for themselves, wrestle with their own problems and learn from their own experiences. But this is definitely a case of easier said than done! I still remember watching my eldest son trying to turn his pyjama shirt the right way out and within a few seconds not being able to help myself but to do it for him. Or now that he is bigger, at the first hint of a problem, I’m often too quick to offer a solution. After all, I’m full of good advice and useful strategies! It’s at these times I try to catch myself and remember: it’s the struggle that makes us strong. We can often fall into the trap of telling someone that something will be “easy” in order to encourage them, but to encourage means to give courage, and down playing the challenge of a task can leave us feeling anything but courageous. After all, succeeding at something easy doesn’t feel like much of an achievement. And the prospect of failing something simple can increase feelings of inadequacy. So if there is a task we are feeling hesitant about and someone says “don’t worry, it’s easy” it can actually serve to increase resistance to the task. There are so many things in a child’s life that they have little control over. Finding opportunities where a child can feel in control of their world by making a choice is an important way of helping them to build their sense of autonomy and agency. It might seem like a small thing to let your child choose between a blue plate and a green one, but giving children the opportunity to exert control where they can often makes it easier from them to accept times when they don’t have a choice. So let your child choose. As much and as often as possible. If you have difficulty practically or emotionally with giving your child complete autonomy, offer a choice between options you would be happy with. For example, if you find it uncomfortable to let your child have complete free reign over what clothes they wear, perhaps offering a choice between two options. Sometimes it can feel disingenuous to offer a forced choice (because that’s not really a choice at all). An alternative can be to invite your child to also problem-solve and offer another possible alternative. When asking a child to offer a solution, it is important to identify the need that the child is trying to satisfy. For example, my youngest child was going through a stage of resisting brushing his teeth at bedtime. He was thick in the stage of wanting to do everything, as he would say, “BY MINE OWN!” But when it came to his teeth, he still needed a little help, so I offered him a choice, “It’s important that you brush your teeth before you go to bed. You can brush them before your bath or after. Or maybe you have another idea to get them done?” He thought for a while and said, “I’ll brush them IN the bath!” And so, for the next few months, he would hop in the bath and we would brush his teeth while he was in there. Simply having some sense of agency had been enough to reduce his resistance to needing adult help. Where possible, rather than saying no to your child’s requests, reframe responses as a conditional yes. So if your child asks to go to the park at 5am, (and assuming you are happy to go later in the day) instead of saying “No, we have to have breakfast, we’ll go later” try “sure, after we’ve had breakfast we can go to the park.” Or if you only have ice-cream on the weekends, instead of “No, you can’t have ice-cream because it’s not the weekend” try “Yum, ice-cream sounds great! We’ll have some on the weekend.” Answering in this way can help build a sense of agency because your child feels heard and that their wishes are being considered. It is hard to watch our children experiencing difficult emotions. Particularly when what they are struggling with is a problem we can solve! In the short-term, solving our children’s problems has the effect of reducing their distress. They feel better. That’s why we do it, right? We want to help them to feel better. Isn’t that what we all want for our children? Although desirable, unfortunately this outcome is strictly short-term. The long-term consequence of “solving” our children’s emotions is that it actually serves to protect those difficult emotions. For example, rescuing a child from anxiety by allowing them to avoid anxiety-provoking situations serves to PROTECT THE ANXIETY. What I mean by this is that when we rescue our children from their emotions, we deprive them of the opportunity to discover that they can actually cope with whatever it was they were experiencing, which allows that emotion to dissipate. Instead, when we rescue them, they may begin to believe “these feelings ARE dangerous” or “I cannot handle it myself.” Ultimately, what they learn is, “see, I was right to feel anxious” – protecting the anxiety. If you struggle with letting yourchild experience difficult emotions, remind yourself that it is okay for yourchild to feel their feelings. Emotions are not problems to be solved – they are feelings to be felt. It is not your job to take away your child’s hard feelings, but to help to support them to work through them. Focus on soothing, not solving, your child’s distress. Rather than providing solutions, empathise with your child and help them to soften, soothe and allow their emotions to be there. One thing that can make it difficult to sit with our child’s emotions is if we have trouble sitting with those same emotions within ourselves. The better we get at recognising, differentiating and responding to our own difficult emotions, the better positioned we are to help our children to do the same. 5. Offer assistance in baby steps. If you do need to step in, try to provide the minimum assistance possible then hand the task back. So if you have asked your child to refill their water bottle and they the lid is too stiff, try “I can see you are having trouble getting the lid off your drink bottle. Here, I have loosened it for you, now you can twist it the rest of the way off.” Do as little as possible to get them back on track to success. Helping our children to build their distress tolerance and sense of agency helps to en-courage them to take on new and challenging tasks. Our goal isn’t to keep our children comfortable – it is to help them to learn that they can be uncomfortable and still be okay. It is by pushing at the edges of our comfort zone that we allow it to grow. It is the struggle that makes us strong.